Happy November wonderful humans! With my favorite month now over (it went by way too quickly) I wanted to share another monthly favorites post. (Here’s my September Favorites post if you missed it!) I have a ton of October favorites since it was such a busy month. So let’s get to it! Cozy Sweaters: Not exactly shocking, I know, but cozy sweaters have been my jam this month! I cannot stop buying them and love that there are so many fall colors of cozy knits. Be sure to check out some of the cozy sweaters I’ve been loving! 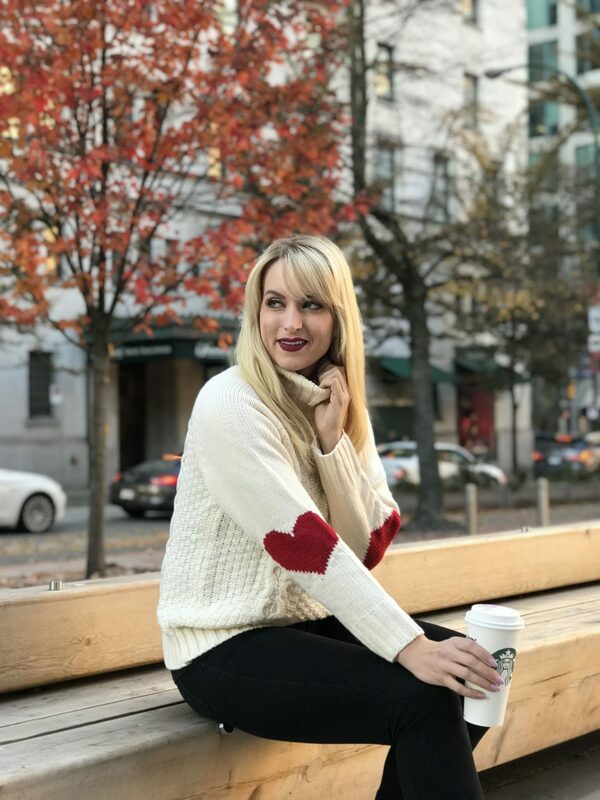 Heart Elbow Patch Sweater: Even more specifically, this particular sweater has my heart (… on my elbow haha. *immediately apoloizes for such a bad dad joke*) The heart elbow patches are just the best touch, and I was seriously surprised / impressed by the quality since this sweater is under $30! Alice & Olivia: I have been crushing on Alice & Olivia pieces even more than usual this month. Alice & Olivia, in general, definitely qualifies as an October favorite. I mean, just look at this emerald velvet blazer & matching pants! Also, I haven’t ordered these yet but my-oh-my I need these pink sequin heels! How fun are they! NeoStrata Clarify Dual Acid Clarifying Peel: I got this NeoStrata product at the LD Beauty event in Whistler (more on that below). I’ve been using it twice a week and can see a real difference in my skin. I have less blackheads and small imperfections. Unlike other masks I’ve tried that fight acne, it is not drying at all. My skin feels moisturized and so smooth after using this! Whistler with London Drugs Beauty Department: London Drugs Beauty Department, aka. LD Beauty, has an annual conference in Whistler where they bring us bloggers up to the gorgeous Fairmont Hotel in Whistler and all the beauty & skincare brands that LD Beauty carries (Revlon, NYX, L’Oreal, Lise Watier, etc) have booths to showcase their newest products. We also get a goody bag (actually a giant box) of items from each which is so incredible. I just love this event because I get to see and try a bunch of great new products, but also because Whistler is such a beautiful city to spend time in. Thanksgiving with Friends/Family: I am so grateful for my friend Sarah, whose family has become my second family. Thanksgiving in Canada was this month (In case any of my American readers are confused haha) and my family lives on the other side of the country. So, my ‘second family’ took me in and we had the best day playing monopoly, drinking wine, and eating way too much good food. 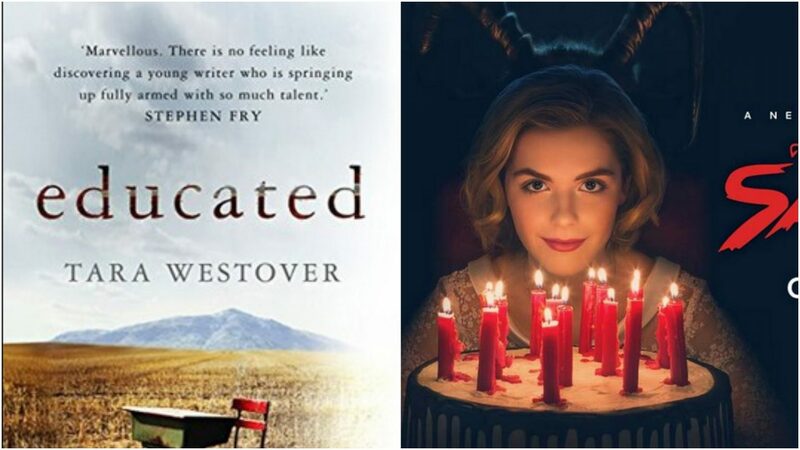 Educated: A Memoir by Tara Westover – This book is incredible. As a voracious reader, I have read my fair share of memoirs. This one gave my chills. I did actually find it a bit dry in the middle, but the last few chapters 100% make up for it. Tara’s understanding of personal growth and navigating complex memories from a traumatic childhood is nothing short of brilliant. This book will leave you inspired, but also with a greater understanding of yourself and your own childhood. Killer Women with Piers Morgan: This show!! If you like true crime, you need to watch this show on Netflix. There are less than 10 episodes total. In each, Piers Morgan interviews a woman convicted of murder. The women range from a 16 year old who killed her parents, to a scorned lover who killed her ex-boyfriend’s girlfriend. It’s a fascinating insight into the thoughts and minds of these women who kill. The Chilling Adventures of Sabrina: I loved Sabrina the Teenage Witch as a kid. Anyone else watch it religiously as part of ABC’s “TGIF”?! When I discovered Netflix had made a ‘grown up’ version of this, I was immediately hooked. My sister was in town and staying at my place last week, and we watched episodes every night before bed! Of the posts I shared on LegalLee Blonde this month, my favorite is probably My Outfit Formula For Fall. I love the corduroy mini so much, and I stand by this general formula to create a gorgeous fall outfit! 1. 10 Things to Do to Prepare for the Holiday Season Now by Through Jam’s Eyes: If you are an organization lover like I am, you will love this post. Thanks to it, I’ve already started prepping for the holiday season! 2. The Brands I Wore in Middle School Are Cool Again? by Sophisticaition: This post was SO fun and unique! I was shocked at how many of the brands I forgot about are clearly carrying really cool pieces again. 3. How I Cured my Cystic Acne Naturally in Less Than 30 Days by Oh So Lovely Life: Praise Nicole for sharing this post! Nicole is a blogger friend of mine, and her and I have complained to each other before about our troubles with cystic acne. I loved this post and am implementing a ton of the tips. Also, if you are into astrology, vegan food or general cool Portland vibes, you will love Nicole! "How to Layer for Work: Mustard Turtleneck & Plaid Blazer"
I am loving everything! That fall look is my favorite and I need to watch that Piers Morgan! Thanks Laura! And yes, you soo do! It’s disturbing, but so interesting! I’m a few episodes in on Sabrina! I love how they completely re-made it. It’s so cool right!! I was iffy on it at the end of episode one, but by the end of episode 2 i was hooked! It sounds like you had an amazing month! I am obsessed with your corduroy outfit! I definitely did! I love October. And thanks babe! I need that heart elbow patch sweater! Soooo cute! Right!! It’s so perfect as we move into winter! So many cute outfits and those tacos in the photo are calling my name!! Thanks Cathy! And haha you must try them! Theyre so good! I am loving that sweater A LOT – Also will checkout the TV shows you suggested. I love your outfit formula for fall! You’re such a babe, and I love the otk boots! I’ve heard great things about the Sabrina show, but also that it is surprisingly spooky. Happy November! I love your Fall outfit so much!! The whole look is perfection and I am swooning over that skirt! I can’t get enough of the cozy sweaters I’m finding this season, they’re awesome! Love that pretty fall look too! I just started watching Sabrina and I’m obsessed! It’s SO good hey! I can’t stop watching!! I’ve heard such great things about Educated! It is seriously so moving. It really makes you think. OMG that Alice and Olivia sweater is GOALS!!! So obsessed w that look and such great other suggestions! Right there with you on cozy sweaters! I’m not sure I have room in my dresser to fit them all — I’m very into chunky and oversized this year. Haha same here! I really need more closet space! Isn’t it great! I love it so far. Cant wait to finish the season. I use to LOVE Sabrina as a kid so I will definitely have to check out this new show! Same! Watching it during ABC’s TGIF is such a strong memory from my childhood. This one is much more scary and dark, but it’s really good. I can’t get enough of the sweater with the heart elbow patches!! So darn cute! I binge watched sabrina in a day! I really loved the new one! Also I love that sweater with the hearts! It’s so great eh! I had to pause (ive watched the first four episodes) because Im away on vacation, but definitely want to get back to watching it once Im home! I am crushing on your sweater with the hearts on the elbows! So darn cute!! Isn’t it awesome! I highly recommend it! Elbow detail/patch sweaters are so cute!! I love the hearts on yours! I agree! I love them so much! I have one with old man style suede patches that I just adore! I can’t wait for Sabrina Season 2 already!